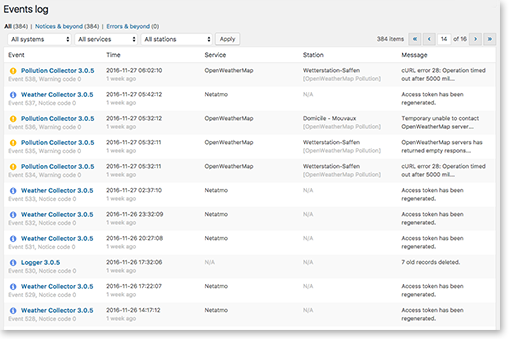 Weather Station: collect & display meteorological data with WordPress! 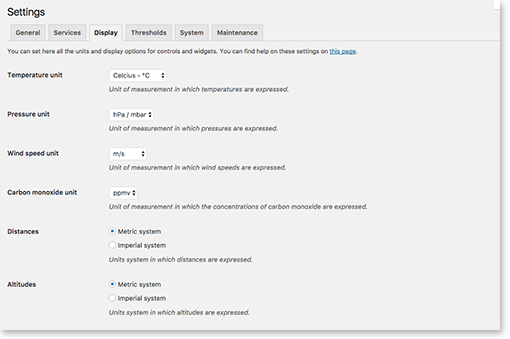 The WordPress plugin to collect meteorological data from public or personal weather stations and to display it in many elegant ways. Reliable, ultra-local and geolocalized weather sources. Unlimited number of stations. Weather Station is the most powerful and accurate plugin! Find the layout that best suits your needs and your site. Insert it into a post, a page or a sidebar and let Weather Station do the rest of the work! Weather Station is retina ready and designed for modern browsers: no flash, only pure HTML5, state-of-the-art SVG and integrated webfonts. Weather Station adheres to the ergonomic and graphic standards of WordPress, there is even a simplified mode… You will never be disoriented! Whether you have ideas for improvement or questions, you will never be alone: the community will always be there! 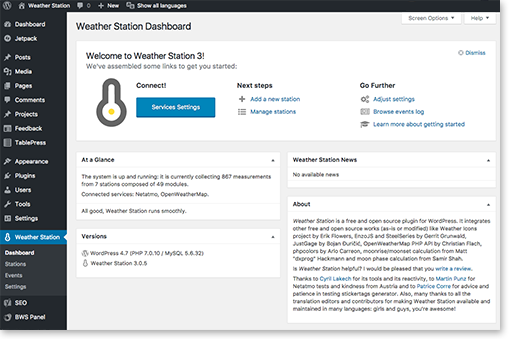 Weather Station is free, open source and ads-free. It is not a freemium plugin: every user has full features. At no cost! Excellent, professionally made and maintained. A great plugin for weather-enthusiasts. Works great with many weather stations. But also beautiful gauges and graphs, including a great calendar-type history presentation that looks superb! The developer responds to questions very quick and effective. This is a really nice plugin for putting you Personal Weather Station on a website. Lots of features are implemented and nicely documented and orchestrated by a developer who puts a lot of hours and efforts into improving and enhancing the plugin. The support is swift and problem solving. A masterpiece. The author really thought of everything while designing it. Professionally designed with very good user interface and flexibility. Quick response on support and well documented. With its familiar dashboard, its integrated help and a fully standardized ergonomics, Weather Station offers you a seamless user experience! Display, behavior, data collect and data management, Weather Station can let you refine its operation in every detail! Or you can ask it to set it for you. Thanks to its high-performance logging manager, Weather Station constantly informs you of the conditions it encounters while collecting data. Cache management, shortcodes rendering and integrated scheduler, Weather Station takes full advantage of the power and flexibility of the WordPress engine, without slowing down your site!